When it comes to summer barbecues, corn is quintessential. This classic vegetable is currently in season in Rhode Island, and will be through October. Usually, one never thinks about what wine pairs well with corn, which is not often the centerpiece of a meal. However, when it comes to corn being a major component, what do you do then? 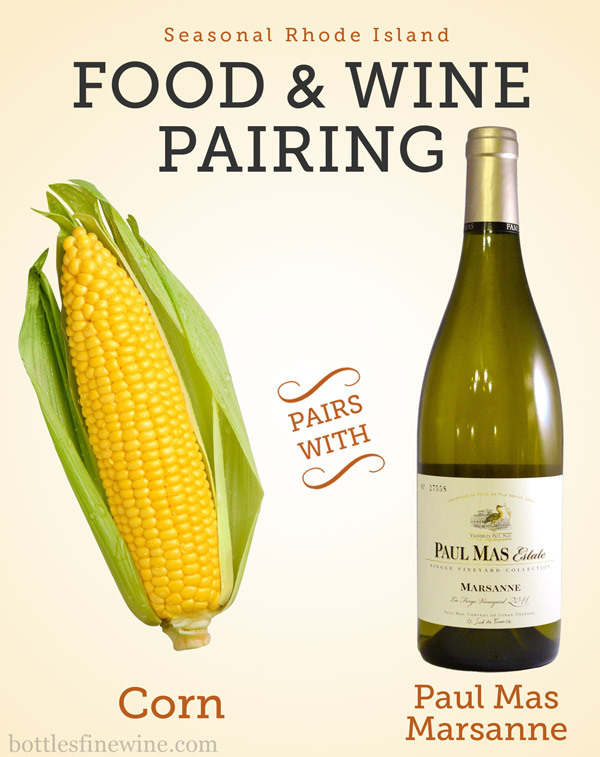 We have cut out all the guesswork, tasted a bunch of wines, and discovered that Paul Mas Marsanne goes very well with corn. Sweet, juicy and versatile, corn is not only a staple of summer meals, but also of fall-time. When it gets cool enough to enjoy that bowl of corn chowder, try making some southern dishes as well, such as succotash or Johnny Cakes. Corn has many incarnations: on the cob, kernels, cereals and cornmeal. Our friends at Edible Rhody Magazine have a delicious recipe for Corn & Poblano Hushpuppies, which are a perfect mixture of sweet & spicy. Visit your local farmers market for the freshest sweet corn or go straight to the farm. Kenyon Grist Mill is the local corn meal here in Rhode Island and every October they have a Johnny Cake Festival that is a great activity for the family! Marsanne is a commonly found grape varietal in Châteauneuf-du-Pape & Côte du Rhône wines. A full-bodied white wine from the Rhone Valley, Marsanne can be found in both dry and sweet styles. This wine lacks the fruit and perfume, and so many times it is mixed with more aromatic grapes. The high alcohol, low acidity, and flavors of pear, spice and melon make it a great wine to pair with seafood, cheese, and of course, corn. Or simply relax and enjoy it on the porch! – Aromas of dried fruits, pear, and violet with hints of vanilla. – A rich, fresh, and mellow palate with a long finish of toasted notes makes this wine pair well with the sweetness of corn. – 25% of the Marsanne is aged in oak barrels, and the other 75% is aged in stainless steel tanks. – The Mas family has been making wines in the Languedoc region since 1892. Visit our store to get this wine! This entry was posted in Wine Pairings and tagged corn, food, ideas, marsanne, pairings, wine on August 14, 2013 by bottlesfinewine. Have you eaten fresh fava beans recently? No? Well, you are missing out on a wonderfully sweet, tender, and versatile legume. Only the perfect bottle of wine can make a fava bean dish even better. In this case, we’re pairing Chablis with this newly in-season vegetable. Discover more food and wine pairings on our seasonal recipes page. While common sense tells us to avoid the culinary recommendations of cannibals, fava beans are actually a great summer ingredient! Fresh, earthy, creamy in texture, and sweet like peas, you can make a delicious risotto, sauce, or pilaf with fava beans. Split the pod, remove the beans, blanch them in boiling water for a few minutes, and cool immediately in an ice bath. Drain, and now they’re ready for a killer salad. A simple way to serve fava beans is tossed with extra-virgin olive oil, salted to taste, and topped with pecorino cheese. Our friends at Edible Rhody Magazine have a great recipe for Pecorino Toscano and Fava Bean Salad. In Rhode Island like us? Visit your local farmer’s market for the freshest fava beans. Chablis from Chablis, France are some of the best Chardonnays there are. The term ‘Chablis’ has been misused to refer to generic white wine, which is not what we’re talking about in this case. You should give real Chablis a try! Dry, steely, fruity, and super refreshing, Chablis is not your grandma’s buttery Chardonnay. Enjoyed with your favorite fava bean dish! Domaine d’Elise Chablis is a white burgundy (100% Chardonnay grapes). Wine has been made in the village of Chablis in Burgundy, France since the ninth century! 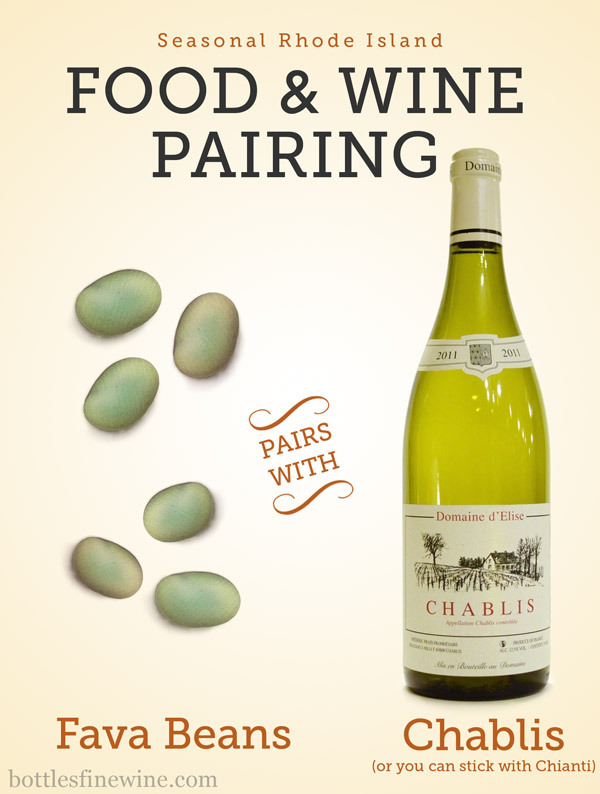 The limestone soils of Chablis give this wine a great minerality that matches the flavor of fava beans. This entry was posted in Wine Pairings and tagged chablis, chardonnay, fava beans, food, idea, pairing, recipe, white wine on July 9, 2013 by bottlesfinewine. What wine is essential for summertime? Rosé! Right between a red and white wine, rosés are dry, and not sweet like White Zinfandel or Blush wines. Rosés have a light berry flavor, which comes from contact with the red grape skins during the winemaking process. But unlike a red wine, rosés are very crisp and full of pep, vigor, and light citrus flavors. They also happen to be great partners with food for your next party! A perfect food and wine pairing we’ve had are BBQ ribs and rosé. Edible Rhody Magazine was kind enough to let us share with you a fantastic Peach Barbecue Ribs recipe. 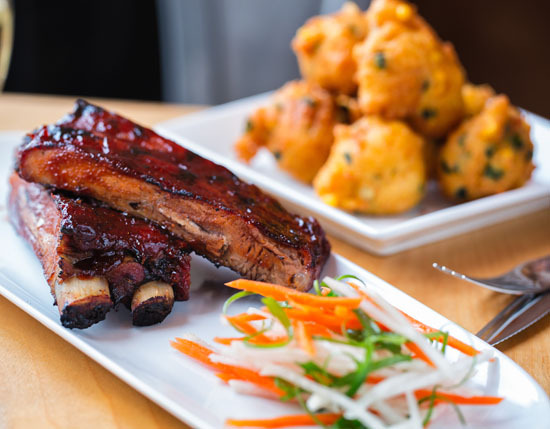 Written by Chef/Owner Nick Rabar of Avenue N American Kitchen in Rumford, Rhode Island, these ribs use a simple dry rub and a barbecue sauce to swoon over. 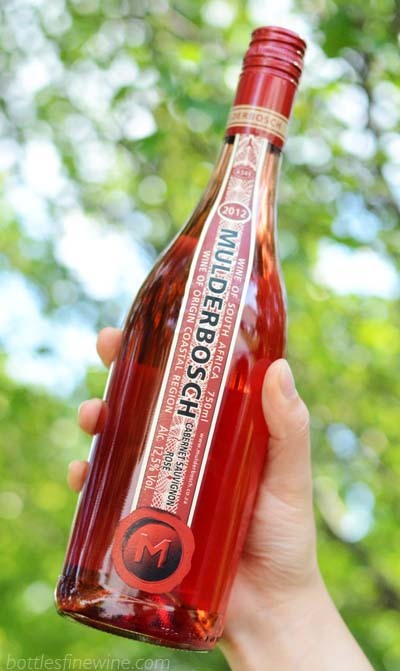 Reward yourself for a job well done with a bottle of Mulderbosch Rosé! Made from Cabernet Sauvignon grapes, Mulderbosch has produced a rosé that’s both sturdy and seductive. The dark pink color lets you know you’re in for a seriously good treat. On the nose, expect blood orange, cherry and sandalwood. Look for bold flavors of ripe black cherries and herbs balanced by zesty acidity. 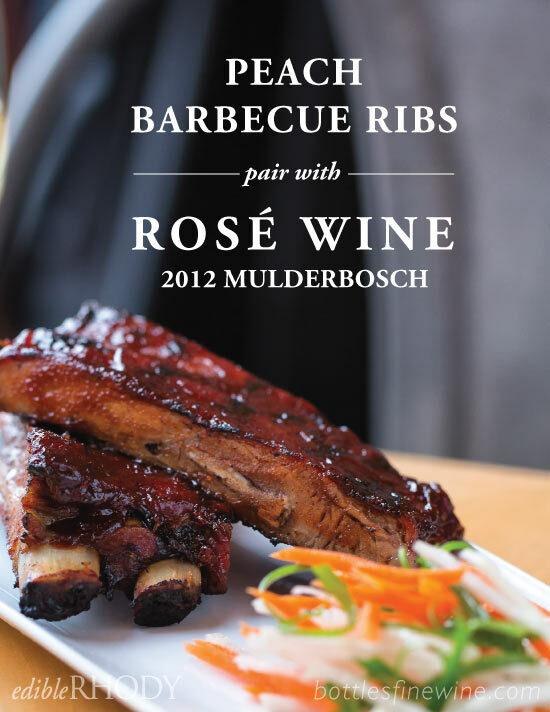 This powerful rosé will love hanging out with you and your ribs. This is the perfect recipe for summer when my grill and smoker are cooking at full throttle. It makes an ample amount of the dry rub and sauce—which go well with chicken too. Feel free to halve the recipes or save the extra for more good stuff on the grill. Coat ribs with dry rub and let stand for 1 hour. Preheat oven to 325°. Place ribs in baking dish and bake for 2 hours, turning occasionally. Heat grill to medium or prepare coals. Place ribs on grill, mopping with barbecue sauce until sauce has caramelized and ribs are tender and sizzling, being careful not to burn. Remove and serve with extra sauce. Serves 6. Note: For smokier flavor, omit the oven step and prepare fire by banking coals to 1 side of the grill. Cook ribs wrapped in foil off the direct heat for two hours, adding coals as needed for a steady, even heat. (Or use top rack on a gas grill.) Finish over heat as directed above. For the dry rub, combine all ingredients in a medium bowl and mix, taking care to break up brown sugar. Store in container with tight lid. For the barbecue sauce, sauté bacon in a 4-quart stockpot until fat is rendered, removing bacon and saving for another use. Add onions and continue to cook until caramelized. Add remaining ingredients. Simmer for 1 hour on low heat, stirring often. Makes 3 quarts. Can be made in advance. Refrigerate for 1 week or freeze up to 6 months. 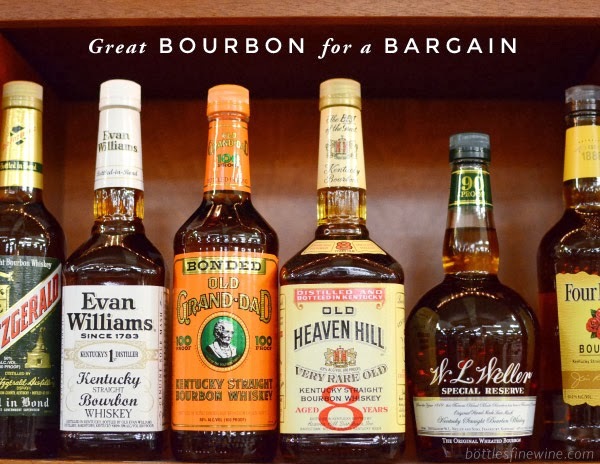 This entry was posted in Wine Pairings and tagged bbq ribs, food, recipe, rose wine, wine pairing on June 20, 2013 by bottlesfinewine.